Newark, CA – April 19, 2004 – Diamond Systems Corporation, a leading supplier of embeddable computer and I/O boards, today announced the availability of the Emerald-MM-Opto PC/104 module. The board has been specifically designed to address embedded computing applications requiring ruggedness and compact size, such as vehicle-based systems and portable equipment. Emerald-MM-Opto offers 4 optically isolated serial ports with RS-232 (point to point), RS-422 (full duplex multi-drop), and RS-485 (half-duplex multi-drop) protocols. In RS-232 and RS-422 modes, it supplies RX, TX, RTS, and CTS signals, while in RS-485 mode it supplies RX and TX signals. The board also includes 24 digital I/O lines with programmable direction and user-configurable pull-up resistors. The board utilizes the compact and convenient PC/104 form factor, making it compatible with over one hundred embedded CPUs from dozens of manufacturers worldwide. Each serial port is independently configurable for protocol and IRQ settings. In addition, the board offers great flexibility in termination methods, enabling reliable operation in any application. Optical isolation of 1000V DC or AC protects the system from ground differentials or noise spikes that would damage non-isolated boards. Extended temperature capability (-40 to +85ºC) enables the board to operate in vehicles such as trains and buses without concern for temperature swings. An advanced 16C2850 UART chip with 128-byte FIFOs supports high-speed data rates at up to 460kbps without overloading the system processor. Auto-flow control allows easy RS-485 operation by automatically enabling and disabling the transmitter during data transmission. 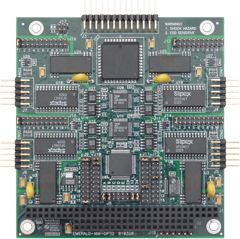 The Emerald-MM-Opto PC/104 module is available in 2 or 4-port configurations. In quantity 1-9, the 2-port configuration (EMM-OPT2-XT) is priced at $180, while the 4-port configuration (EMM-OPT4-XT) is $240. Volume discounts apply for both when purchasing 10 or more units. For more information on this and other Diamond Systems products, call (510) 456-7800 or visit www.diamondsystems.com. Diamond Systems, founded in 1989, was one of the first computer peripheral manufacturers to adopt the PC/104 embedded computing standard. Today the company is a leading supplier of PC/104 CPU, data acquisition, serial port, and power supply modules to the embedded market. The company also designs custom CPU and I/O boards.